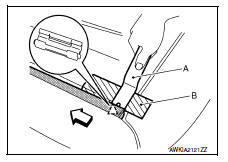 Release roof side molding rear side clip, using a suitable tool (A). Apply protective tape (B) on body to protect the painted surface from damage. Pull up roof side molding from rear end to front end. 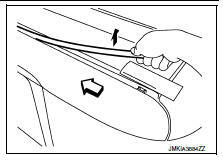 Use care when pulling the roof side molding to avoid damaging. 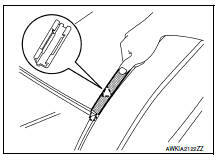 Release windshield molding and clip at the front end of roof side molding, then remove while pulling toward vehicle rear. Heat adhesive tape using a heat gun and peel roof side molding clips (body side) using a suitable tool. Clean tape removed surface with isopropyl alcohol or equivalent. Apply adhesive evenly to clip tape surface. Position applied parts to the proper location, and then sufficiently press-fit until the adhesive protrudes to tape side. 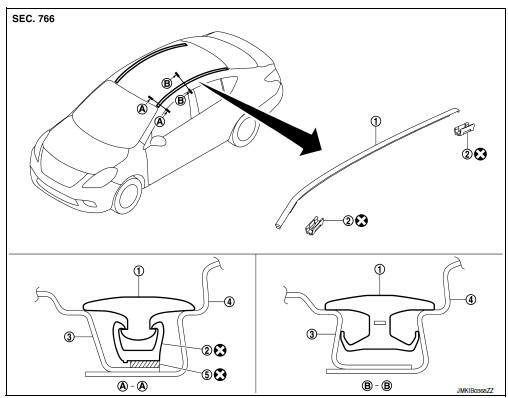 Tape roof side molding clips after press fit and temporarily hold it for specified time based on the following. Use double-sided tape after hardening for roof side molding clips. Securely insert molding rear end cap onto roof rear end cutout (installation standard). When installing roof side molding of windshield glass portion, check that body side molding fastener is securely inserted and then press in. Do not wash the vehicle within 24 hours so as to keep adhesive dry.